You are brilliant at what you do. You and your team have come up with an innovative product—one that makes so much sense, it practically sells itself. Except it doesn’t. That’s because it can only do what you designed it to do. It might even do what it was designed to do far better than any other product was ever designed to do it. But it still can’t sell itself. For that, you need people who know how to turn what you’ve made into a story everyone wants to hear. But where do you find these people? Typically, they work at advertising agencies, branding firms, design firms and digital agencies. These firms come in all shapes and sizes, from 200-person agencies to one- or two-person shops. Here’s the thing. There are a LOT of moving parts in a successful brand launch. All of these firms will say they can do it all. Don’t believe it. They all have their strengths, but for the other stuff, they hire help. The only ones who can make a “full service” claim are the big ad agencies. Everybody else only does part of it. Advertising agencies range from small, local operations to large multinationals. The upside of working with a large, established and reputable firm is that you are going to get quality. The downside is that they will be expensive. Big agencies need big budgets. Sometimes you can get a large agency interested in negotiating an agreement in which the firm gets paid far less than normal in exchange for “creative freedom.” In other words, you get a break on the price, but they get to do whatever they want creatively. This is a very common scenario in the creative business. 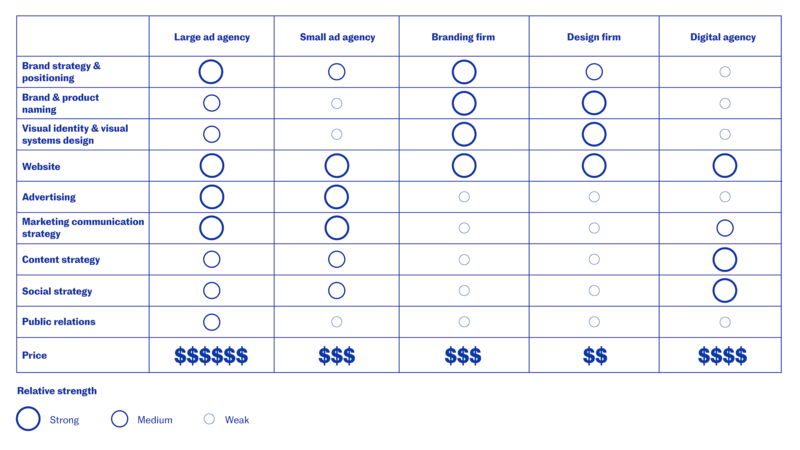 You can work with a smaller agency or design firm the same way, or, since their rates are going to be lower, you may even have budget to just pay them what they normally get for this kind of work. Either way, it’s fair to expect that no one is going to work for free, unless they’re desperate. And you don’t want desperate. There are other services that are critical to a successful brand launch: marketing communications strategy, content strategy and social strategy. Most mid-to-large ad agencies can provide these services. The smaller guys, not so much. There are visual communications agencies that call themselves branding firms. These are usually graphic designers with lots of depth in visual identity and visual identity systems design. Their claim to “branding” lies in their ability to design logos. Don’t get me wrong, you need a good visual identity. But in a firm like this, branding means visual identity design. The better ones have strategists on staff and can offer brand strategy development as well. This is a perfectly legitimate way to go. Any self-respecting visual communications design firm does visual brand design (logo and visual identity system design). It’s one of the few remaining opportunities for graphic designers to demonstrate what they do better than anyone else. Choose a good design firm and you will get a good logo. But you might not get good strategy. And you won’t get any of the communications, content or social strategy pieces mentioned earlier. Yes, it can be confusing. That’s why we made this chart. Down the left side are all the tasks that fall under the category of branding. Across the top are all the different firms that offer some or all of these services. The dots represent where they are strong. The bigger the dot, the stronger they are at that particular task. The chart shows you that no single provider is equally good at everything. There are two ways to deal with this. One, pick a firm that can deliver all of it and accept that it is going to be better at some things than others. The upside is you’ll have consistency across channels and deliverables and fewer suppliers to manage, and you may even get a break on the price. The other approach is to hire different firms for each task, based on their strengths. This is the “best in class” approach. Here you’ll get top quality—but you’ll spend a lot more time managing vendors and have more trouble achieving a consistent result from one firm to the next, and this process generally costs more. Leave this approach to the highly experienced senior brand managers. If that’s not you, don’t even think about it. You can buy it all at once or in stages that correspond with funding thresholds. Let’s say you are a startup that has just got its seed funding. To get started, you will need a brand strategy, a name, a visual identity and a website. You don’t need advertising, marketing communications, content or social strategy just yet. So, you may choose to invest in the first four items only and wait until you are more established and better funded to start investing in longer-term brand-building. In this scenario, you might choose a branding firm or design firm: they will deliver the highest quality of this kind of creative at the best price. Since Series A, B and C funding are generally for scaling your business, that’s the time to think about all the remaining strategic pieces (e.g., marketing communications, and content and social strategies) and their deployment. At that point, you’ll have more funding to play with, so you can afford to start looking at agencies. If no one in your firm has experience buying these kinds of services, seek the help of a seasoned senior creative consultant. There are many individuals in the market who work alone and who know how the creative business works and everybody in it. Perhaps you could enlist one on a contract basis to be your finder. There are industry publications where you can generally see who the players are. Two such Canadian magazines are strategy and Applied Arts. Both are Toronto-based, but national in scope. There are industry organizations like RGD (Association of Registered Graphic Designers), which operates in Ontario. On a national level, there is GDC (Graphic Designers of Canada) and The Advertising & Design Club of Canada. These organizations publish directories of members. You can also find lists of top digital agencies in Canada. Here’s an example. Let’s say you’ve found two or three candidates. How do you decide? Money aside, there are other criteria to consider. Probably the most important is personal chemistry. You want someone you can disagree with and still get along. That’s key. Some companies like to put their candidates in the ring and ask them to compete for the job on spec. That means, “show us your creative, we’ll pick the one we like the best, and then we’ll work with the winner.” This is a common practice in the ad world. (Not so much in the design or digital world, by the way). It is NOT a good way to begin a working relationship. You are going to be very profitable. Why should your creative people not be compensated? Make your decision based on creative skills, capacity, price and personality. Don’t ever make price the sole decider. Branding for startups: Developing your initial brand strategy. Elements of a product’s value proposition: Functional, self-expressive and emotional benefits. The pay-per-user revenue model: B2B sales for software. Implementation and control: Kotler on marketing.